The MURDER OF CROWS trade (Saga of the Swamp Thing volume 4), written by Alan Moore, teams up Swamp Thing with the magician Constantine as they attempt to prevent an ancient secret society of male witches called the Brujeria from unleashing pure evil upon the world. The dark history of the Brujeria make them fanatical villains who will stop at nothing to accomplish their goals. There are side treks along the way, including people being hideously transformed after consuming some strange pods that fell off Swamp Thing’s body, encounters with a mass murderer obsessed with the eyes of his victims, and a great one about a haunted house that borrows heavily from the legend of the Winchester Mystery House but still contains some very creepy hauntings inside. In the main storyline, Constantine and Swamp Thing work to assemble a team of DC’s occult heroes to combat the coming evil, including The Specter, Dr. Fate, Phantom Stranger, Zantana, Zatara, Etrigan, Sargon, Deadman, Baron Winter, as well as Cane and Able from the old House of Mystery and House of Secrets comics. Some of them don’t survive the conflict. The artwork is done by various artists throughout, all of which did a great job rendering this evocative tale of terror. I was happy to noticed Marvel’s Man Thing hidden in a panel as well. I don’t know this particular story, but Alan Moore is at his best in DC horror. I really loved it. I’ve read very little DC stuff, but I’ve already purchased another Swamp Thing trade (also written by Alan Moore) as well as a Constantine trade, mostly due to how much I enjoyed this one. I won’t get into it (spoilers!) 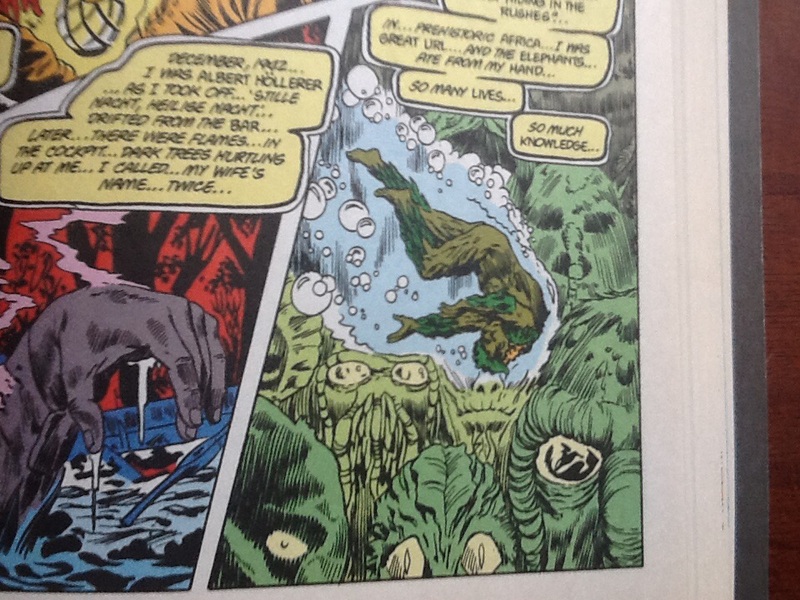 but it is interesting how Swamp Thing’s relationship to Alec Holland changed over the years. BTW- speaking of Moore, did you ever read Whatever Happened to the Man of Tomorrow? That was the “conclusion” of the silver age Superman story, just before John Byrne relaunched Superman around 1986. It is a 2-parter and the end of part 1 is a guaranteed tear-jerker. http://www.amazon.com/Superman-Whatever-Happened-Man-Tomorrow/dp/1401227317/ref=sr_1_1?s=books&ie=UTF8&qid=1426036403&sr=1-1&keywords=whatever+happened+to+the+man+of+tomorrow This volume also includes a Swamp Thing tale. I’ve never read that Superman issue (or almost any Superman comic to be honest), but I’ve heard it mentioned from time to time on Podcasts. I’m unaware of Alec Holland. He must not have appeared in this trade. I started reading an earlier trade and now know who Alec is. I don’t believe he was ever called by that name in Murder of Crows (unless I just missed it). Look up Moore on Youtube they have a number of interviews with him that are eye openers. He commented about comics made into movies and made the statement that when you go from one medium to another you lose something. I thought about it and he was right. I’d heard he never wants to see any of the movie adaptations of his works and that he’s kind of eccentric. He’s definitely an amazing writer from the little I’ve read so far. Interesting post, Matt. I must admit that I’m not much of a comic book fan, although I did used to really love the original Hellblazer comics featuring John Constantine. But, as a bit of a shameless claim to fame, I did used to know Alan Moore going back around 20 years or so, we’re both from Northampton and moved in the same circle of friends. And, strangely enough, I knew Jamie Delano (the writer of the original Hellblazers) a bit too, I nearly set up an arts and crafts business with his wife. That’s very cool! I bought a trade of Constantine the other day, but I thought it might be better if I read the first one before I start it, which they didn’t have in stock at the time. I’m sure you’ve probably already read it but, if not, then Moore’s Watchmen is an incredible piece of work. I have read that one. Previous to this Swamp Thing trade, it’s the only thing of his I’d read. It is excellent!